Yorkshire Pudding. Those crisp little cups of love made just for filling with rich flavorful gravy! They are not hard to make at all, they just take a little bit of time and planning! Traditionally they are served with roast beef but go well with any meat or poultry dish. Break the eggs into a large bowl. Using a wisk, beat well to break up the yolks. Add the milk. Now add the flour and salt. Wisk well to combine thoroughly. Place the batter into the fridge for a couple of hours. You have choices as to what kind of cooking vessel to use to cook the puddings off. Muffin tins, bread pans or even cake pans work well. Spray the pans well with non stick spray. I never skip this step, even when using non stick bakeware. Pour a tiny amount of canola oil to cover the bottom surface of the pans. I always place the pans onto cookie sheets before going into the oven. It helps catch any spills or overflows which can make one heck of a mess at the bottom of the oven. Place the pans into the oven to heat for 10 minutes. I like to pour the batter into a large measuring cup for the next step. It makes quick work of a hot job. Leaving the pans in the oven fill them half full with batter. Bake for 25 minutes. It is never to soon to try again! Spraying the pans makes all the difference. It is a great recipe I always have success with. Enjoy your next batch, I am sure they will be amazing. Non-stick spray….I wish I had seen your blog entry before my first attempt at homemade pud on Sunday night. They rose beautifully, tasted wonderful but were impossible to get out of the pan without completely mangling them. Is it wrong I want to try again already? Might just have to make Yorkshire Pudding for Easter just because. Thanks for the tip! Hey Sean! It is time! They are super easy and this recipe makes quite a few. You’ll definitely get your fill. Hi Eva! Really all it requires is nice cold batter and super hot pans. Be sure to place a cookie sheet under whatever pan you end up using. They can overflow quite easily. Mmm, this makes me miss Sunday dinners. I could never get enough of these whenever we had them at home. I’ve never tried to make them myself — maybe it’s time! This looks simple! I love Yorkshire pudding, but I thought it requires certain baking techniques.. Thanks for sharing! Hey Louisa! It is the trick to perfect puddings. Agreed Meaghan, it is the best part! Thanks Diana! It think it is all in the hot pans an cold batter. It really makes for a great rise. Good seeing you! Thanks for stopping by. Thanks Rosa! I love when a recipe turns out this great! Thanks for stopping by. 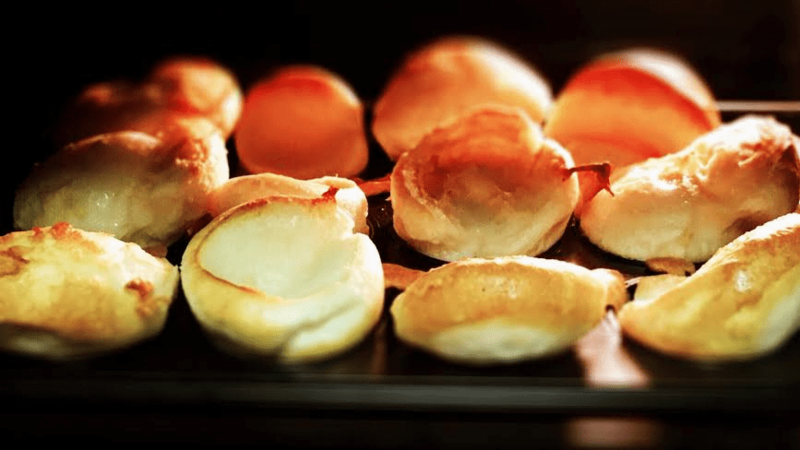 There is nothing better than hot out of the oven yorkshire pudding! Always my favorite part of a roast beef dinner. Great recipe! I love Yorkshire puddings! They remind me of Sunday dinners with my family. So important to always grease the pans and preheat the tray in the oven before baking. My grandmother used to make these and it was something my mother never quite mastered, as hard as she tried. You make it look so easy! I’ll have to try your instructions. I love Yorkshire puddings! Yours look fantastic.